At the end of the 20th century, Dubai attracted international media attention as the world sought to make sense of the city’s extraordinary growth. Exuberant projects such as the Burj Arab, the Burj Khalifa and the Palm Islands attracted investment in dreams to transform the region. 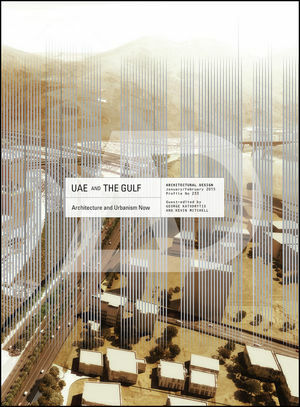 While the global financial crisis kept dreams from becoming reality, this issue of AD seeks to present a view of architecture and urbanism in the United Arab Emirates (UAE) and other states in the wider Gulf Cooperation Council (GCC) at a time when greater economic stability promises new beginnings. The issue presents examples of architecture that transcends preoccupation with fabricating images, and traces the process of making contemporary Gulf cities, from material tectonics to large-scale masterplans. By presenting the architecture of UAE and the Gulf within the context of broader regional developments and global trends, it highlights how projects in the UAE, Qatar, Kuwait and Saudi Arabia have contributed to unprecedented urban growth, while emphasising the continuing environmental challenges of building in the region. In addition to highlighting various sustainable initiatives intended to counteract these challenges, the issue also explores how computational design and new technologies are being innovatively employed to mitigate the impact of arid climates. Contributors include: Ameena Ahmadi, Kelly Hutzell, Varkki Pallathucheril, Todd Reisz, Rami el Samahy, Terri Meyer Boake, Jeffrey Willis. International architects: Foster + Partners, Frank Gehry, HOK, IM Pei, Legoretta + Legoretta, Jean Nouvelle, Reiser + Umemoto, Allies and Morrison. Regional architects: AGi (Kuwait), DXB.lab (UAE), X Architects (UAE). Kevin Mitchell Kevin Mitchell has taught at AUS since 1999 and currently serves as Interim Provost. Areas of research and writing include design pedagogy and contemporary architecture and urbanism in the Middle East. His recent work has appeared in The Superlative City: Dubai and the Urban Condition in the Early Twenty-First Century (Harvard University Press, 2013), Architecture and Globalisation in the Persian Gulf Region (Ashgate, 2013), Transfigurations: Photographs of Tarek Al Ghoussein (Black Dog Publishing, in press) and The Courtyard House: Between Cultural Expression and Universal Application (Ashgate, 2010). He is a founding Editorial Board member for the International Journal of Islamic Architecture. George Katodrytis is currently Associate Professor of Architecture at AUS. He studied and taught at the Architectural Association (AA) in London and has been a visiting professor at various schools around the world. He has built a number of projects in Europe and the Middle East, and published widely on contemporary architecture, urbanism, cultural theory and digital media. His work addresses the Gulf 'city', especially as it is evolving in the 21st century. He is also involved in a series of design projects in territories of limited resources that include children’s homes, schools and refugee camps in the Middle East and Africa.